Finding the right food for your dog is an incredibly important process – there are just so many brands out there, you might not know which one to pick! Orijen and Royal Canin are two of the most prominent and well-known dog food brands out there, but when it comes down to it you might have trouble picking which one to stick with when you’re standing there in the dog food aisle. **Below, you'll find our expert's science-backed reviews, but you can also click the links above to see current prices or read customer reviews on Amazon. Orijen Dog Food prides itself on offering “Biologically Appropriate Dog Foods,” meaning that they take care to include as balanced and organic a diet for its canine consumers as they can. To that end, Orijen works hard to ensure that their products have higher than normal concentrations of whole meat, including chicken, egg, red meat and wild-caught fish. Because of this diversity, Orijen’s dog food provides a more complex array of proteins and minerals than a lot of conventional dog food (which is an incredible plus for your dog). As with all dog foods, it is vital that you look at the ingredients list to see if there’s anything your dog might react to in a not-so-positive way. 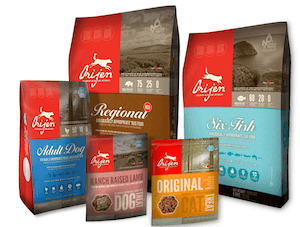 In the case of Orijen Dry Dog food, there’s plenty to write home about; most of the ingredients include the aforementioned whole meats like chicken meat and meal, as well as liver, herring, turkey, whole eggs, walleye, salmon and more. In addition, Orijen includes a wide variety of healthy fruits and vegetables, including red and green lentils, chickpeas, peas, butternut squash, blueberries, fennel, kelp and more. When gauging the product by its ingredients, Orijen Dog Food seems to be incredibly stuffed with all-natural ingredients, with a 5.6% fiber content so you know your dog is getting all the digestive help it needs. What’s more, the food is essentially grain-free, which is good for those owners with dogs sensitive to grain. When you look at the numbers, Orijen’s products are up there with the best dog foods on the market. According to Dog Food Advisor, its dry matter protein content is 42%, with 20% fat and 30% carbohydrates and a fat-to-protein ratio of 46%. Orijen’s food has more protein and fat than most other dog foods, but fewer carbs than on average. Furthermore, you just can’t beat that level and variety of vegetables in a dog food product. I mean, come on – fennel and kelp? Lentils? Your dog will be eating better than most people! Orijen’s process for making the food is also highly laudable, and should be a real consideration when thinking about investing in this brand. In addition to cultivating fresh local meats, fruits and vegetables from their Canada-based operation, the company also infuses their food with powerful probiotics that aid in boosting your dog’s immune and digestive systems. All in all, Orijen is a powerful and incredibly healthy solution for your dog’s nutritional needs. All of the proteins, vitamins and minerals that your dog will receive come from all-natural sources, which is enough of a blessing in today’s world of processed animal foods. Royal Canin Dog Food is another brand that seeks to get into the doggy health food market, touting optimized formulas that offer individualized nutrition for your pets, and even have pure breed-specific solutions for the discerning dog owner. 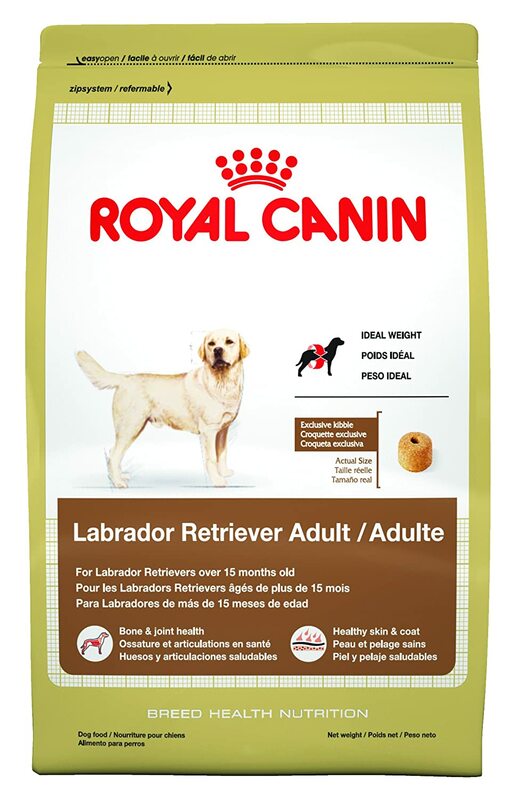 Royal Canin has been around for quite some time, and offers a wide variety of products, specific to all manner of popular dog breeds, from Pugs to miniature Schauzers and beyond. However, with this kind of specificity and diversity comes a few specific problems which we’ll get into later. Unlike Orijen Dog Food, Royal Canin seems to offer a higher proportion of grain and artificial products to provide carbs and protein for your dog. For the Yorkshire Terrier brand of Royal Canin, for example, the most commonly found ingredient is brewers rice and chicken by-product meal. Wheat gluten and corn gluten meal can also be found in the food, as well as corn, cellulose powder, dried beet pulp, vegetable oil and more. Going down the ingredients list, you can also see a host of other confusing and perplexing ingredients like choline chloride and magnesium oxide, which further speak to the artificiality and processed nature of Royal Canin Dog Food. Like Orijen, Royal Canin has a 5.6% fiber content, which s still good. Both brands are good choices for your dog’s nutrition, but there are some differences you might want to keep in mind when making your dog food selection. Overall, Orijen is probably the better overall dog food. Holistic Select Dog Food Reviews, Ratings, Recalls, Ingredients! 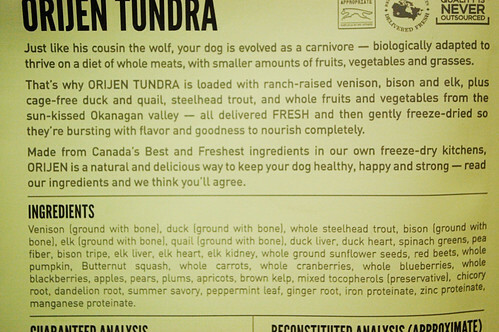 Taste of the Wild Dog Food Reviews, Ratings, Recalls!